Emilia Romagna Lines ticket reservations, ferry timetables and passenger information for Emilia Romagna Lines sailing to and from the Italian region of Emilia Romagna and Croatia, from Ravenna, Cesenatico, Rimini, Pesaro to Rovinj, Lošinj and Zadar. Booking Emilia Romagna Lines tickets has never been easier, we compare all Emilia Romagna Lines prices in real time providing fast quotes so you can buy the cheapest available Emilia Romagna Lines tickets to and from the Italian region of Emilia Romagna and Croatia, from Ravenna, Cesenatico, Rimini, Pesaro to Rovinj, Lošinj and Zadar online with instant confirmation. So whether you are looking for a day's shopping ferry trip abroad or a holiday break travelling by Emilia Romagna Lines is a quick, easy and stress free way to get there and back again. Book you Emilia Romagna Lines car or passenger ferries tickets with us and enjoy more choice and flexibility. With the latest Emilia Romagna Lines crossing information and timetables for all ferries sailing to and from the Italian region of Emilia Romagna and Croatia, from Ravenna, Cesenatico, Rimini, Pesaro to Rovinj, Lošinj and Zadar including information on the ferry ports and useful tourist information about the destinations our detailed route and city maps will help you plot your Emilia Romagna Lines ferry journey. If are travelling by car, with your family or as a solo foot passenger book a ferry crossing with Emilia Romagna Lines and arrive at your destination refreshed, relaxed and happy. Emilia Romagna Lines offers fantastic fares to and from the Italian region of Emilia Romagna and Croatia, from Ravenna, Cesenatico, Rimini, Pesaro to Rovinj, Lošinj and Zadar ferries ports. Book Emilia Romagna Lines tickets to and from the Italian region of Emilia Romagna and Croatia, from Ravenna, Cesenatico, Rimini, Pesaro to Rovinj, Lošinj and Zadar online in advance at Ferryto.co.uk and you will always enjoy our cheapest available ferry ticket price. The price you see is the price you pay. There are no hidden extras or surprises such as added fuel surcharges or booking fees and we do not charge you anything extra for paying with a Visa Electron card. The price we quote you for your selected Emilia Romagna Lines route, onboard accommodation and vehicle type is all you will pay, and that's a promise. To obtain a Emilia Romagna Lines ticket price and book your ferry ticket securely online please use the real time ferries booking form on the left. Emilia Romagna Lines is a fairly new ferry service that has emerged from the success of cruises along Romagna coasts to the idea of filling the market gap of a fast connection between Italy and Croatia, a route that until now, has not been available as a high speed passenger service. Emilia Romagna Lines offer low cost ferry crossing across the Adriatic Sea. Emilia Romagna Lines ferry routes run between the Italian region of Emilia Romagna and Croatia, from Ravenna, Cesenatico, Rimini, Pesaro to Rovinj, Lošinj, Zadar onboard their high speed catamaran ferry. Emilia Romagna Lines uses the best technologic solutions, constantly keeping its guarantees up to the highest safety standards. Emilia Romagna Lines carries 267 passengers. Indoors, the catamaran "Eurofast" is built with full attention to details, air-conditioned and soundproof, and assures passengers an easy and comfortable travel. Every space is accurately optimized to guarantee any passenger a comfortable sailing and striking views. The snack-bar, on the main deck is always on duty and provides a fast and reliable service for a very relaxing travel. It assures pleasant moments of refreshment. The story of Emilia Romagna Lines tells a tale of love for the sea and life across the sea, of ideas which have turned a sailor into a businessman and his family into the core of a company. Emilia Romagna Lines comes from a challenging entrepreneurial idea, brought and realized by a group of company associates, that, along with Righetti family, embodies the best nautical tradition in the Adriatic Sea. The basic idea of the new project comes from the creativity of a company that has proven along the years a stunning ability in suggesting the most advanced and up-to-date transport solutions. 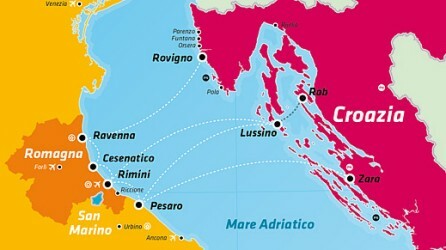 From the success of cruises along Romagna coasts to the idea of filling the market gap of a fast connection between Italy and Croatia, comes the creation of the new service, a radical innovation in the Adriatic Sea navigation outline. Emilia Romagna Lines concretizes with the Catamaran "Eurofast" the new fastest service, also the most complete and efficient one. Best Price Guarantee - We always offer you our lowest available Emilia Romagna Lines ticket price and there are no hidden extras or surprises such as added fuel surcharges or booking fees and we also we do not charge you anything extra for paying for your ferry ticket with a Visa Electron card. The price we quote for your selected Emilia Romagna Lines car or passenger ferry ticket, onboard accommodation and vehicle type is all you will pay for your ferry ticket, and that's a promise! In the unlikely event you find the same all inclusive Emilia Romagna Lines ticket cheaper in the brochure of any other tour operator we promise that we will do our best to beat that price or offer you the choice of requesting a refund. To book Emilia Romagna Lines tickets please click here. Discounted Group Travel with Emilia Romagna Lines - Ferryto.co.uk offer a dedicated personal and affordable Emilia Romagna Lines group and coach party ferry passenger reservation service offering you the lowest available ferry rates. Our specialist Emilia Romagna Lines group travel team will secure the best deal for you and your passengers. The only requirement to qualify for discounted group travel ferry rates is that your party should be at least ten people and travel at the same time. For more information about group travel on Emilia Romagna Lines please click here. Ferry Logistics offer a personal and affordable Emilia Romagna Lines freight and cargo ferries reservation service to and from the Italian region of Emilia Romagna and Croatia, from Ravenna, Cesenatico, Rimini, Pesaro to Rovinj, Lošinj and Zadar. In addition to offering preferential rates to commercial operators and haulers Ferry Logistics is now also able to offer discounted ferry freight rates to private customers such as those wanting to take transit vans on any of the Emilia Romagna Lines routes serviced. For more information and an instant online quote for your commercial vehicle ferry crossing please click here. At ferryto.co.uk you are able to obtain live Emilia Romagna Lines ticket prices, check availability, view ferries timetables and book Emilia Romagna Lines car and passenger ferry tickets at our lowest available ticket price. Ferryto.co.uk is part of the world's largest online ferry ticket distribution network providing the ability to book over 80 major European ferry operators including with Emilia Romagna Lines to over 1,200 ferry routes throughout the UK, France, Spain, Ireland, Holland, Eastern Europe, the Mediterranean, the Baltic and North Africa. Choose Emilia Romagna Lines ferries for the cheapest ferry ticket prices to and from the Italian region of Emilia Romagna and Croatia, from Ravenna, Cesenatico, Rimini, Pesaro to Rovinj, Lošinj and Zadar. We also have ferry offers to more distant ferry destinations and mini cruise destinations like Ireland, Holland, Italy, Spain, Denmark and the Greek islands.